Blog and let's talk Bar-B-Q! Our BBQ chicken is moist and full of flavor. Try our crusted, baked macaroni and cheese. Our customers rave about it! Actually, they rave about all of our homemade sides, like the BBQ baked beans, collard greens, and string beans. Oh...um have U tried our homemade pies? Apple, Sweet Potato, Pecan, or Banana Pudding? Our sister company KennyMac Entertainment (kennymac.net) can provide all your music entertainment needs. 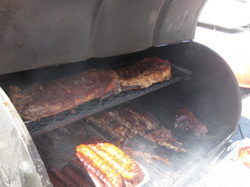 We will BBQ on location, Set-up and serve, or deliver. Call today. 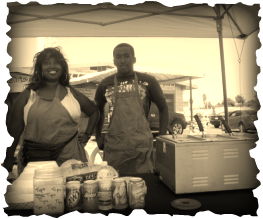 Announcement Bahama Mama BBQ now accepts credit card! 10% OFF for orders between June 1 - June 30, 2011.